In order to give all of our potential customers a better idea of the level of Internet performance that should be expected at MacStadium.com with all of our Hosting plans, we decided to complete an "Around The Globe" speed test compilation based on the Ookla Speedtest.net Internet benchmarking site. Internet performance benchmark results are always subject to various factors including the network performance & availability of the remote Host as well as the Internet transport network performance & availability between MacStadium and that remote Host. In general, due to the limitations which are created by the speed of light, the further your remote Host is geographically located away from MacStadium, the higher your latency (PING time measured in thousandths of a second) will be. Additionally, long geographic distances will also decrease your odds of actually achieving full 100Mbps performance because the route which each data packet travels around the Earth will become more complicated as it travels from one transport network to another - until it ultimately reaches its destination at that remote Host. The results we are posting here are based on the actual benchmarks as represented in the video. 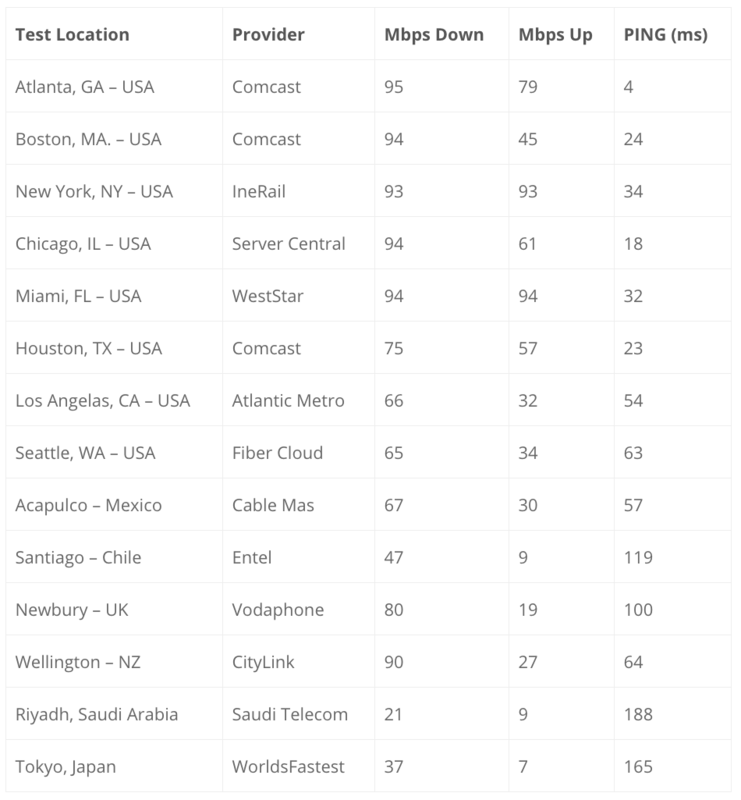 In every geographic region, there are multiple Speedtest Hosts available, and they all perform differently at different times of the day. Some Hosts are faster, and some Hosts are slower. These performance results are just a sampling to provide some idea of what to expect. Based on what many of our customers are telling us, many of our competitors like Amazon EC2 are only delivering a small fraction of the Internet performance that we deliver here at MacStadium, while at the same time they charge a much higher monthly rate.